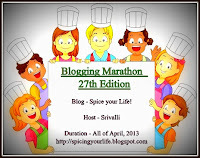 For the whole of April, I would be taking part in a month long blogging marathon, hosted by Srivalli. 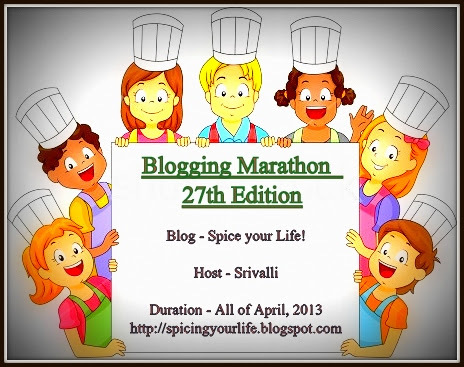 Each week there would be a different theme and the first week we need to blog recipes suitable for any special occasion (Weddings, Parties, etc). For today I have chosen this recipe which is suitable as a snack for the kids, appetizer at kid's parties. Also the bread baskets themselves can be used in a variety of creative ways. They can be used to serve dessert like ice cream or fruit custard. You can also serve any kind of chaat in these baskets. You can get as creative as you want!! So for Day 1 Week 1 of BM #27, check these cute baskets of veggies :). Remove the sides of the sides of all the bread slices. (Don't throw the sides, instead pulse them and use them bread crumbs for another recipe). To get a perfect shaped basket, cut out a huge circle from the resultant bread slice. But I chose not to waste any more bread. So I didn't do the additional trim. Apply butter on one side of the bread slice and neatly line a muffin plate with the buttered side up. Preheat the oven to 375F and bake the bread slices for 10 min until the baskets get crispy. Set aside for further use in the recipe. Boil all the vegetables, add salt, pepper or red chilli powder, chaat masala or garam masala and the tomato sauce. In each of the bread basket, add the mixed vegetable curry and top it with cheese as needed. Place each of them in a muffin plate and bake in the oven for about 12 min or until the cheese is brown. Serve warm and watch them disappear enjoy the sight of loads of smiles! Very interesting baskets..ya they surely can be used in many ways...super idea, love it! very cute and lovely bread baskets . I too made them once, flower shaped ones. They are perfect for tiny hands. Love those bread cups, very brilliant idea and health baskets. Such a crowd pleasure this dish is Harini..I love this, only thing that prevents me from making this often is the individual basket that needs to be done!..love the filling you used.. Cute baskets :) I made another version of it sometime back. I have one small tip. Next time roll the bread to a thinner version and then put in the mould. Makes it very very light and crisp. My bread baskets (the only time I made it) were totally inedible..don't ask me how it happened! These look cute and is a sure crowd pleasing recipe! Basket looks so crunchy even adults will love this. Indeed these look cute. The filling is also so inviting. Perfect bite sized party food. Those bread baskets look super cute. Great idea for parties. Filling looks delicious. Cute baskets for kids.They will surely enjoy these. A sure crowd puller. Thanks for the detailed procedure on the bread baskets . I will surely make these. totally drooling here.. what a clever idea.. worth all the effort..